I don’t know about you, but the last few months of 2015 have been a whirlwind for me! On September 7th I ended my last day as an AmeriCorps member and started my first course in graduate school that same evening. A week later I found out that I was hired by the Elks National Foundation! Honestly it's been a lot to take in at once, but luckily the holidays have served as a reprieve from the hustle and bustle of the past few months. Now that I’m settled into my new role as a Programs Assistant in the Community Investment Programs office, I finally feel like I have a grasp on things. Before moving to Chicago and ultimately working at the ENF, I served as a corps member with City Year Washington, DC (CYDC), a nonprofit that works to combat the drop out crisis. In my role as a corps member I taught English/Language Arts and Mathematics to 5th grade students at risk of falling off track and organized events such as AttenDances to get students excited about school. My time with CYDC and my Kimball Elementary School team really left an impression on me and made me feel as if every person can help contribute to making the world a better place. As an added bonus, I got the chance to make a great set of lifelong friends. Celebrating a completed year of service as corps members with CYDC. 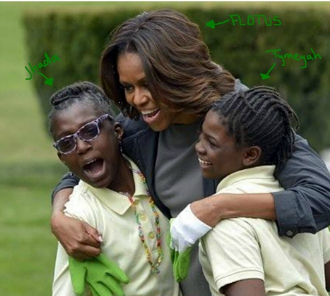 Two of my students hanging out with the FLOTUS. They were even featured in the Washington Post! 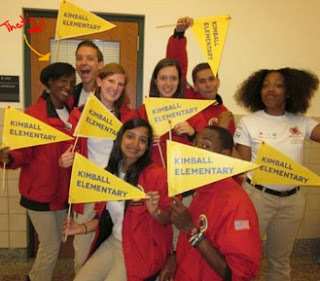 After my time with City Year, I moved to Chicago to be closer to my family in Gary, Indiana (and yes, before you ask, it is Michael Jackson's hometown) to complete another year of AmeriCorps with Literacy Volunteers of Illinois, a program that focuses on adult education. Although it was a change from working with fifth grade students, teaching literacy to adult learners relied on some of the same techniques. I was placed at Albany Park Community Center, a neighborhood known nationally for its diversity. While there, I had the opportunity to meet people from Yemen, Afghanistan, Djibouti, Guatemala, Bangladesh and the list goes on. I learned so much about the life of immigrants and the difficulties many experience when arriving in the United States. Living in a country with a high literacy rate, it’s easy to take reading for granted. However, for many arriving in the U.S. with no literacy skills in their native language, acquiring the language and reading skills to survive can be a harrowing experience. Prior to applying for my position with the ENF, I knew very little about the Elks. I had seen the building many times before and often wondered what went on inside. After seeing the position posted online, I did a little research and was amazed at the Foundation's level of community investment. The mission of helping Elks build stronger communities really aligned with my belief of service to a cause greater than self. What impressed me even more was the fact that members decide on projects that best suit the needs of their communities. Sitting at my new swanky desk. 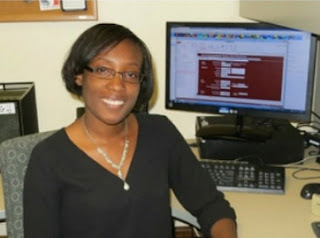 but before that I was learning how to use the grants database. Now that I’m here, I’m really excited about what’s in store for 2016. I know you've probably heard that the Elks National Veterans Service Commission will invest four million dollars (yes $4 million dollars!) to eliminate veterans' homelessness. Last month, I had the chance to attend a dinner sponsored by the ENF to learn more about veterans initiatives throughout Illinois and I can’t wait to see how the Elks will play a critical role in supporting our nation’s veterans. I hope you enjoyed this blog post featuring all things Chelsea, but I have to get back to reviewing Gratitude Grants. Don’t forget the deadline is May 31, 2016 so apply today! The Elks National Foundation helps Lodges serve their communities by offering $2,000 Gratitude Grants. Lodges are eligible to apply for Gratitude Grants after meeting the National President’s per-member goal for giving to the Foundation. In addition, Lodges that exceed 15 percent membership support last year may be eligible for a $500 bonus. To find out more about Gratitude Grants and the Community Investments Program, visit www.elks.org/enf/community.